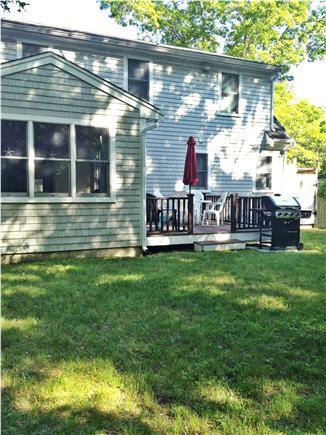 This home is situated in the private community of Popponesset in Mashpee. The full length front porch awaits you and your guests, inviting you into the spacious open kitchen/dining/living space. Just perfect for entertaining. 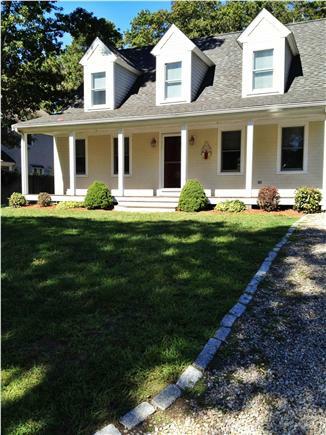 This home boasts loads of natural light,perfect for your summer get away on the Cape! 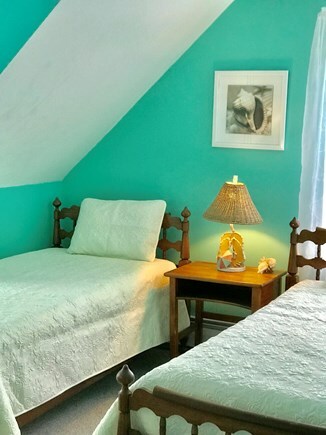 As soon as you enter you will feel right at home in this beach house with it's coastal themes. The living room has a flat screen tv, gas fireplace opened to the second floor. 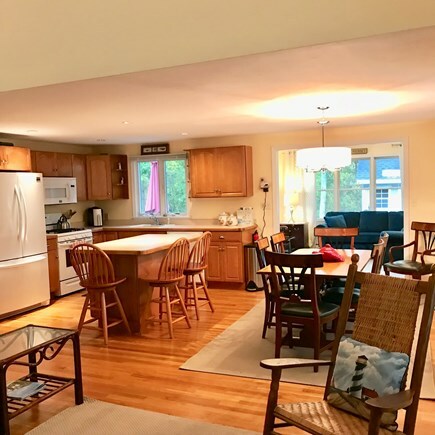 The fully equipped kitchen/dining space is perfect for a quick meal at the center island or entertaining friends and family gatherings at a spacious dining area. 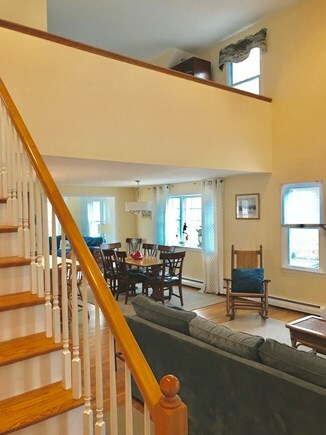 The sunroom is right off the dining area with three walls of windows and ceiling fan. 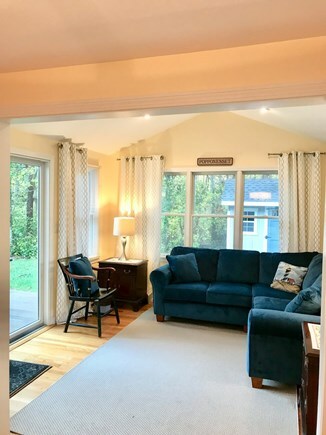 The sunroom has plenty of seating and with a sliding glass doors to the mahogany deck. A gas grill, outdoor shower and private back yard abutting wooded conservation land for extra privacy. 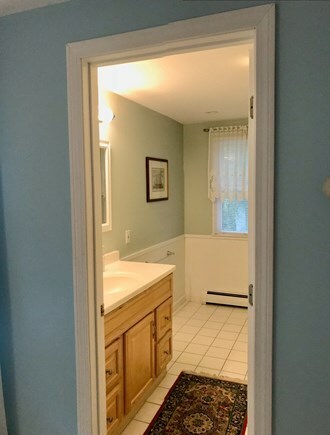 To the left of the kitchen, you will find a half bath. Then on to the spacious master bedroom with an oversized master bath. A comfortable queen bed awaits you and great closet space for all your belongings. 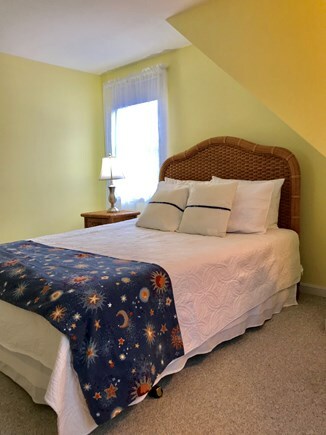 The additional two bedrooms are located upstairs with a full bath. 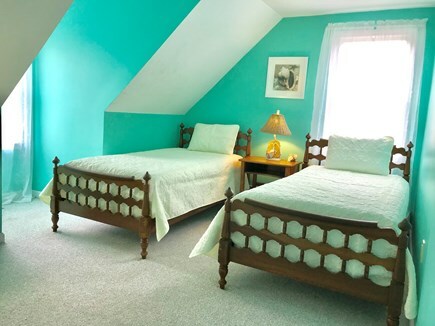 The first bedroom has a queen bed and the second bedroom has two twin beds. 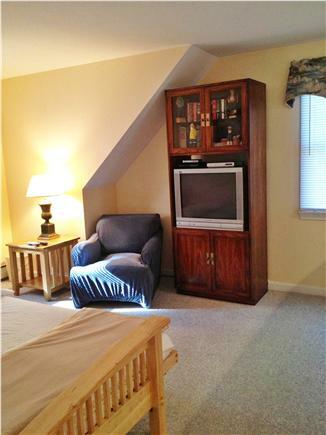 There is a loft area as well,with a futon that sleeps 2, with an additional television. This room overlooks the family room. The beach air a short walk and the warm waters of Popponesset Bay on Nantucket Sound will have you in the water all day and there's even views of Martha's Vineyard.Take a beach walk to''The Spit''to catch minnows and crabs or fish at Deans Pond right across from the beach! The Popponesset Market Place within walking distance from our home or the beach has the BEST Lobster Rolls at the Raw Bar. Thursday - Sunday there is live entertainment for kids and adults of all ages. And the Poponesset Inn right on the ocean has a great bar indoors and out! Their restaurant is right there on the ocean too! Popponesset is a child friendly neighborhood, great for biking,roller blading,walking and jogging. Even better we have our very own children's Community Center with daily activities including movies,dances,softball,crafts and more! The Cape Cod Children's Museum is a short 5 minute Drive. Mashpee Commons is close by with restaurants,bars,quaint shops,clothing stores and a bowling alley, a movie theater and more!! Golfers will enjoy the many golf courses in the area. Additional availability info: Late June, July and August we rent by the week starting Saturdays. This is a Saturday to Saturday vacation rental. Additional pricing info: $100 Cleaning fee applied to stays less than 7 nights, State and local taxes of 12.45% will apply. A perfect find in Popponesset! A gem of a find in the quaint village of Popponesset! Absolutely perfect vacation we have had during our extended stay in September. The house itself is very comfortable with a large living area downstairs including two very comfortable sectionals. The kitchen was fully stocked with anything you might possibly need..I knew the minute I walked into this great home that Jody and Tom, the owners, were adamant about making their guests feel at home. The first thing I noticed was the cleanliness of the home and the special touches that made it so much like home. The downstairs bedroom was large with comfortable bedding. A great master bath was located off the master bedroom downstairs. 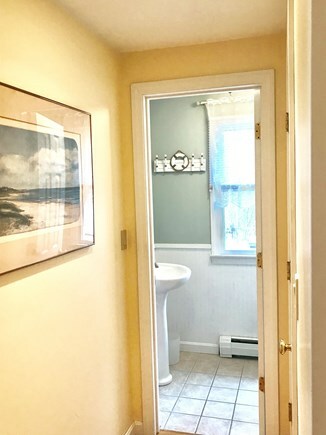 An additional half bath was also located on the first floor. 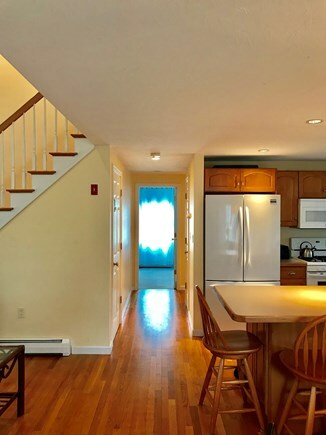 Upstairs are two additional bedrooms of ample size and a loft area with a second TV. 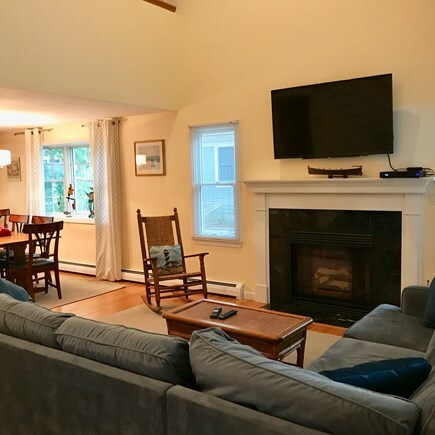 We have vacationed on the Cape for many years and I have to say that this is the best home we have rented for so many reasons. The location is perfect, five-minute walk to the beach and five more minutes to a quaint Marketplace boasting several shops and eateries... the beaches were beautiful and quiet. Great location on the Cape for whatever direction you choose to venture to. The neighborhood is a great neighborhood to walk, and very scenic as you walk towards the beaches. We have a 10 year old Golden Retriever that we were fortunate enough to bring with us. The owners had no qualms about pets, a definite plus for all of us dog lovers who enjoy spending our vacations with our best friends! After a long New York winter and stressful work and school year, my family and I needed to replenish with a fun and relaxing vacation (which is exactly what we got) . Cape Cod was our first choice, and Tom and Jody's house "sealed the deal." The house is simply perfect. The interior décor is warm, the rooms are spacious and the facilities are plentiful. The location is what vacation dreams are made of. The residents were friendly, the neighborhood was peaceful and everything you can possibly need was a short walk, jog or bike ride away. We rented the house on Memorial Day weekend for a wedding gathering. The house was very clean and well appointed, and the owners were very accessible and quickly answered any questions or requests we had. The large bedrooms accommodated our large family of nine, and we spent a lot of time lounging on the back deck. The house is about a 10 minute walk to the beach, which was beautiful. We thoroughly enjoyed our stay. Home is great with plenty of space for parents to entertain as well as the kids. A very relaxing place that is a short walk to great beach, and if the weather turns, a great place to enjoy time indoors as well. Thank you, Jody and Tom, for sharing your beautiful house with us. From the minute we arrived to when we left, you were always available to us. The layout of the first floor is so accommodating and comfortable. We especially appreciated the brand new couches as well as the large screen television over the fireplace. It was nice to be able to spread out in the living room and the sunroom. 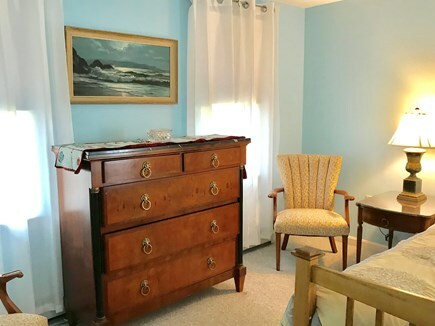 The location is perfect for a short walk to the beach or a bike ride over to Popponesset Marketplace. The neighborhood is quiet and filled with lots of families. Everyone seems to take great pride in their homes. Although we were greatly disappointed with your review, we realize that feedback from our guests can be a valuable tool to help us improve our guests’ vacation experience. We only wish we could have had the chance to make things right for you. Had you told us that the grill wasn’t working, we would have fixed or replaced it the next day. We have since replaced it. We understand your frustration having to call us for instructions regarding check in. I did respond to you within an hour and extended an early check-in to you with which you graciously accepted. Although we supply linens and towels, our cleaning staff does not have sufficient time to make up the beds. This is the first time any tenant has objected to this process. We apologize that you had to empty the dishwasher and have spoken to our cleaning crew to make sure they check it in the future. As stated in our rental agreement, the refundable damage deposit is due within 30 days of check out, and it was sent to you within that time period. I was recently given the opportunity to stay at this wonderful Cape Cod home for the long Labor Day weekend. 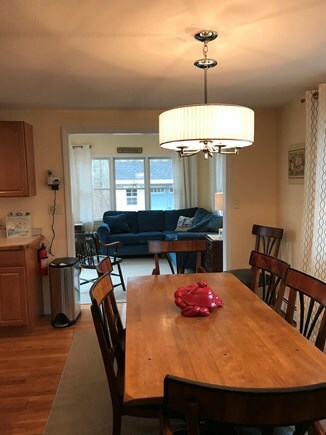 Nestled in a little community called New Seabury, this home was just a short walk to the beautiful shore of Popponesset Beach. A private community, New Seabury had everything the Cape is known for. 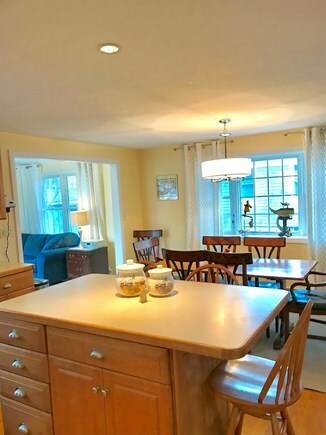 My family and I luxuriated in the quiet and peaceful setting this Cape Cod home offers. On our arrival, we were pleasantly greeted into a well appointed and immaculately clean home. I refer to it as a home because I felt right at home the moment we walked in. We could not have been more elated to find we would be spending the next few days here. I cannot say enough about the owners of this property. 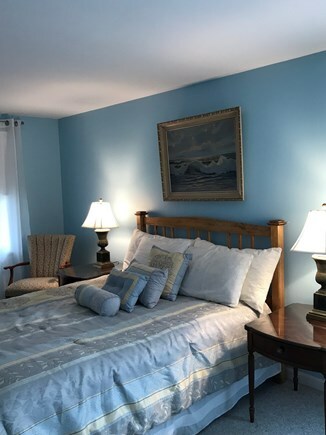 They are highly invested in their guests' satisfaction and made every effort to make sure our stay was an enjoyable one, they were only a phone call away to answer any of our questions and were happy to accommodate any needs or concerns we had. Needless to say, our biggest problem was where to park the extra car our unexpected family members showed up in. Jody, the owner, solved the parking arrangements and also gave us several recommendations for restaurants and food shopping. She was wonderful to deal with. All in all, our experience at this home was exceptional. I would highly recommend this property to anyone. It was truly unique. My husband and I rented this property for the weeks before and after my daughter’s wedding. 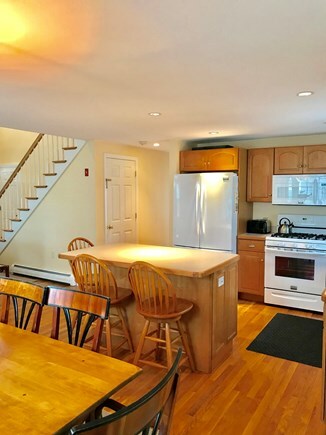 It was a fabulous 2 weeks, both because of this property we rented and because of the location on Cape Cod. The property was perfect for our needs. It is extremely spacious, comfortable, clean and nicely decorated. The proximity to the beach was also perfect, a short walk of just a few blocks away. And the beach was one of the nicest I've ever been to! My daughter’s wedding reception was at the Popponessett Inn, which was less than 1 mile away. Also less than 1 mile away is Popponessett Village, with great shops, restaurants, entertainment and things to do for people of all ages! The property had plenty of seating for guests, both indoors and outdoors. The front porch was such a nice space to begin and end the day. There are beach chairs and a beach cart to take all of our stuff to the beach. There are plenty of sheets and towels available – and a fabulous outdoor shower which I highly recommend! It seemed there was always a cool breeze at the house. It was so nice to come back to this home nestled under trees after a day at the beach. The neighbors were friendly and beyond nice! The location in and of this community felt so family friendly and safe! The day of my daughter’s wedding, we hosted a brunch for the bridal party including flower girls, hair and makeup artists, and additional family members – about 25 people in total. It went off beautifully - everyone was calm, comfortable and enjoyed spending time together before the wedding. The wedding at the Popponessett Inn was absolutely fabulous, a magical and memorable night for all who attended! The home owner was just a phone call / text away if we needed anything or had a question. I feel extremely lucky to have found such a nice place to rent for such a special occasion in our lives. Thank you, Jody, for helping to make it so memorable! I really appreciate your feedback and I can't thank you enough for taking the time to review our property. Popponesset is truly magical and what a perfect setting for a wedding. Especially at the Popponesset Inn! I feel honored that you chose our home for such a special event in your lives and I feel blessed whenever I enter our home and think of all the happy memories that are made there. It was such a personal pleasure to work with you. I couldn't be happier with the way it all turned out. The McNamara's house was beautiful! It was decorated nicely, was very cozy and fit our family's needs. The layout of the house is perfect for families and gatherings. The proximity to the beach was perfect. We used the beach buggies to cart our personal belongings to the beach. We would highly recommend this home to families and would definitely stay here again!!!! Thank you so much for sharing your beautiful home! We loved it! Thank you for taking the time to write such a lovely review!! We just love our house too!! Its layout is truly perfect for gatherings and those beach buggies sure do come in handy!! Maybe we'll see you next summer!! Jody, I just wanted to say thank you for the wonderful week we had at your house. The house was perfect. It is so open and spacious and clean. Everything we needed was in the house. The short walk to the beach was great. My daughters, mom, and sister-in-law visited us while we were there and they loved it! I will be checking dates with the family and would love to book again next summer!! Thank you again. Thank you so much for taking the time to review your stay . It was a pleasure having you and your family as our guests. I'm so happy you enjoyed your stay and our home. Yes, please stay with us again!! Our home is your home! !